Ascent Classes providing classes for Class VI-XII (All Subject) & Tuitions for Class VI-XII .I have started from 2009 year. I have good passion and knowledge in teaching classes for maths,physics,chemistry, English, computer and commerce. 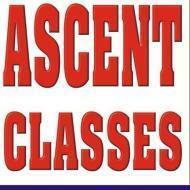 Ascent Classes conducts classes in Class 10 Tuition, Class 11 Tuition and Class 12 Tuition. It is located in Barra, Kanpur. It takes Regular Classes- at the Institute.